Andersen® is celebrating 115 years of building quality doors and windows for new homes, remodels and replacements worldwide. Our products last longer than they need to, work better than they have to and cost less than they probably should. Andersen® and Nothing Less. 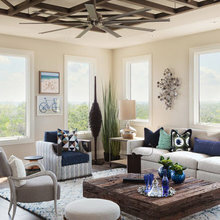 “I think you can really see a big difference in high-end quality craftsmanship.” –John Dean, Contractor At Andersen, our drive to make windows that are different and better has been at the heart of our company for over a century. Since the very beginning in 1903, it’s led us to pioneer new products, set higher standards for our entire industry and, ultimately, become America’s premier window manufacturer. And as a result, we are proud and truly humbled that homeowners recommend Andersen more than any other brand*. Why? Because they trust the Andersen brand more than any other. And contractors, the people whose reputations depend on the windows they use, buy and install ours more than any other brand. 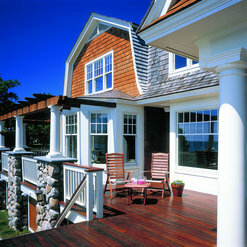 * In fact, for 20 years running, builders have used Andersen® windows more than any other brand. 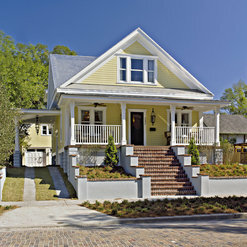 ** So whether you're renovating your home, replacing, or building from the ground up, trust Andersen. The purpose of this posting is to inform potential buyers of problems inherent in the black Andersen 400 Series windows that we did not discover until after delivery. A description of the problem and the ongoing resolution process follows. BOTTOM LINE: Our black clad windows have prominent gray exterior miters and gray “blobs” in every interior corner, and many of the exterior corners are not fused together smoothly, yet Andersen reps say that they are within Andersen’s internal specifications. The windows look terrible. If the attached “before” pictures do not appear attractive to you, do not order black Andersen 400 Series windows. ---Problem--- We are having a custom house built and selected Andersen 400 Series casement windows (with a few awnings and fixed) with black exteriors and white interiors. These are vinyl clad, wood windows. 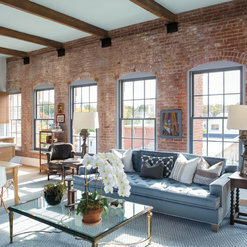 The price of the windows was roughly $33,000 and consists of 58 window units (note that three window units were from Andersen’s Architectural Series due to their unavailability in the 400 Series). We selected Andersen because the feedback we received from builders and dealers was that Andersen has fewer callbacks than other brands and that Andersen maintains spare parts for its windows for decades (this is our retirement home, so longevity and low-maintenance are key goals). When the windows arrived, we were surprised and disappointed to see gray vinyl miters on the exterior corners (distinctly visible from ~80 feet away from the house!) and gray vinyl “blobs” in the interior corners of all of the window sashes of the 400 Series windows. There were also numerous minor abrasions (appeared to be from packaging rubbing on the windows during transit) and a handful of significant dings. Some of the dings appeared in the exact same place on more than one window, leading us to believe that they were manufacturing-related. See the attached “before” pictures. We feel that the problems are defects, and that the defects are serious enough that they should not have made it past quality control at the factory. - My husband had a telephone call with the Field Service Manager for VA, NC, and TN who stated that the problems we were experiencing were known issues, although they did not occur very often. - I called Andersen Customer Service, and the representative with whom I spoke told me that the material used in the miters and corners of the 400 Series are color matched. Our builder’s dealer did not mention that there would be color mismatches at the corners, and none of the Andersen documentation we have reviewed (including the 296-page Product Guide) illustrates or describes the lack of color matching or excess interior corner vinyl material. - We received an email from the Atlantic Coast Territory Sales Rep stating that the windows were “within our specifications.” We responded by requesting a copy of all relevant, consumer-facing specifications. 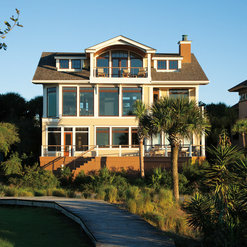 The sales rep responded stating that, “We are unable to provide you with any additional documentation regarding specifications since they are proprietary.” - In a follow-up telephone call with this rep and his supervisor (Regional Sales Manager, Atlantic Coast Region), they restated that the windows were within specifications and said that they could not release the specifications to us. If we ordered new black windows, they would show up with the same mismatched color issues. They were unable to explain why the Field Service Manager and Customer Service provided information indicating that the windows were defective. - They also told us that only the white vinyl cladding is the same color throughout. All other colors use gray vinyl as a substrate to avoid thermal problems with the vinyl on hot, sunny days. Note that the lack of a solid color throughout seems to explain the apparent fragility of the black finish to abrasions and dings. We looked at some white 400 Series windows on our builder’s house, and minor dings and scratches are much, much less visible due to the solid color throughout. - We requested that Andersen replace all of the windows with identical windows with white exteriors. They have, so far, declined. ---Process--- - The problem was discovered on or about November 28. - On December 1, Andersen received a letter, including pictures, that we sent to our builder stating our concerns. - Andersen was slow to respond and has focused on onsite repair of the miters/corners using touchup paint, a Dremel tool, and a small chisel (December 18). The repair tech did not attempt to address other scratches and dings. 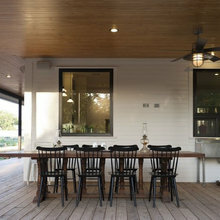 The initial results were not acceptable to us (I was unable to attach “after” pictures due to Houzz posting limitations). - We emailed all parties with our evaluation of the results, and told them that we did not have time to experiment with repair methods for windows that were flawed upon delivery. At that time, we requested a full replacement with white exterior windows (December 20). - After waiting for two weeks, on January 3, my husband and I finally had a telephone call with the Andersen sales managers where they made it clear that the windows met their internal, proprietary (i.e., secret) specifications, and that new black windows would be the same. They felt that since the windows met their internal specifications, the likelihood of replacement was slim. They continued to encourage that we let them try different repair methods and indicated that to that point, no one with the decision authority to authorize replacement windows had been engaged. We asked that they engage a decision-maker, and they promised a decision within two days. We also made them aware that we would be posting our experience on this forum. Two days have passed, and we have not received any additional communication from the Andersen reps. External work on our house has mostly ceased, and internal work will slow or cease soon. We are stuck on certain finish decisions (e.g., roofing colors) because we don’t know for sure what the final exterior window color will be. We’ve spent over a month waiting. We need Andersen to back its J.D. Power Initial Quality Awards with action. We will post follow-ups as warranted and hope that Andersen will live up to its reputation and quality awards and resolve our issue properly. It has been a great experience working with Andersen Windows, the level of service and quality of each product exceeds our expectations. Our customers have been very happy with the final product and the utility and usage of Andersen's windows! It has been a pleasure working with Andersen Windows for several years now. They always stand behind their warranty and make a high quality high product in the industry. 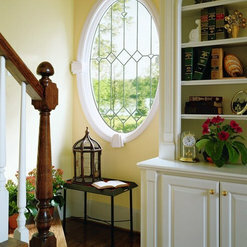 I have specified Andersen windows on almost every project that have gone threw my office for over 17 years. They are my choice when recommending windows to my clients. I specialize in sustainable residential design and have always been impressed with the level of commitment that Andersen takes regarding sustainability. 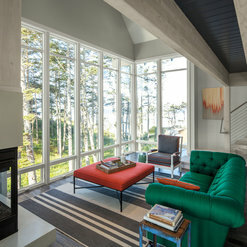 I would highly recommend Andersen Windows to anyone wanting a quality energy efficient window. I have recently put new Andersen Windows 100 series in my home. They are beautiful and supremely functional. My service was so good that when they came to install the safety latches the tech notices some glass was not tempered and wouldn't pass inspection. They notified us of this and are replacing the the regular glass. Unbelievable service! Thank you! Wyatt Drafting & Design Inc.
Over the last 18 years I’ve specified Andersen Windows in hundreds of homes for all my clients. I used Andersen Windows in my own home too. Andersen offers many options, sizes, styles, and several types of muntins too. That's nice. My experience with Andersen has been positive and local reps have been helpful as well. Anderson Windows is a product I can trust! 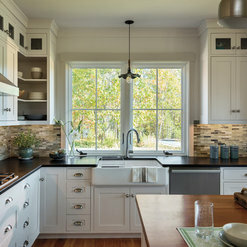 As a remodeling designer I am confident in recommending Anderson Window products to my clients. 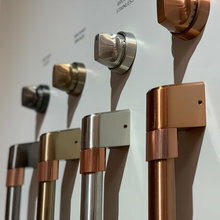 The quality of craftsmanship is superior and the different products available make it easy to select the best solution for any project that I am working on. Thanks Anderson Windows! Thank you for choosing Andersen. Please let us know if there's anything we can help you with in the future. As a Remodeling Designer with Kootenia Homes, I recommend Andersen and there is always a positive response.The Andersen name sells itself because of its quality. Thank you for offering products that I may confidently specify. Thank you for specifying Andersen products. Please let us know in the future if there's any way we can help you with your projects. I have been designing homes for over 30 years and I always use Andersen windows as my go to window for as many designs as I can. I know that when I specify Andersen windows for my customers I know with confidence that my customer will be getting a quality window. I also know that in the years to come if any of my customers have warranty problems with their windows, Andersen will take care of them. I can't say enough good things about Andersen Windows, and yes I have Andersen windows in my home. Thank you for the kind words. It means a lot to us when our trade customers also use our products in their own homes. It's really the ultimate compliment. 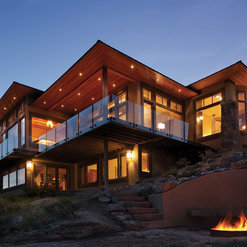 Kootenia prides itself on finding and using the best products in its new homes and remodeling. 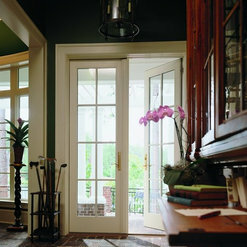 Over the years we have tried many different brands of windows and keep coming back to Andersen. Not only do they built a superior product to the others but the most important part for a builder is they stand behind their product. Everyone can have a failure but its what you do after a failure that sets you apart from the rest. I would recommend Andersen windows and yes I have them in my own home. Kootenia - We're so glad you've had such positive experiences. Thank you for being a strong Andersen supporter and please let us know if there's anything else we can do to support your business. Used their window products often. 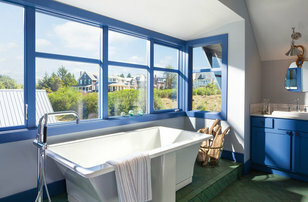 From the late 1980's I have been personally installing Andersen replacement windows in many homes. They (Andersen) stand behind their product and they perform well. 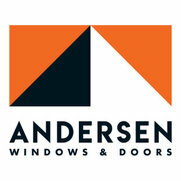 I would highly recommend windows that are built by Andersen because they have been a great product over the years. 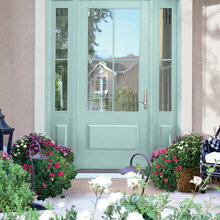 Here at Michael Lee we are 100% Andersen window builder. We love the products but especially love the service provided. We can always count on Andersen for years to come. After all these years in business one thing is for sure - use the best products available and your clients will thank you. Commented: WindowsWe're loving the dark exterior colors they chose for this house! Let us know if you have any more questions about our windows.